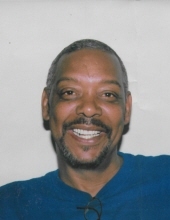 Michael Jerome Booker, 60 of Nottoway County, VA departed this life on December 27, 2018 at his home in Crewe, VA. Michael was born to Mary Elizabeth Booker and Walter B Oliver on June 19, 1958 in Richmond, VA.
At an early age he gave his life to Christ and was baptized at New Poplar Mount Baptist Church in Crewe, VA.
Michael received his education in Nottoway County, and completed a trade program in Carpentry at Southside Skill Center. his multiple flags on the back of his chair. He was truly a man after God’s own heart. Mike always had an encouraging and uplifting message for whoever he encountered. Michael loved to sing his gospel music and had the voice of an angel. He loved watching his sports. Michael love being with his friends and family. He was the life of the family where you would find him telling jokes and keeping everyone laughing. He was a man who loved his family as well as others and the love would always be returned to him. He was preceded in death by his parents, Mary Elizabeth Booker and Walter B. Oliver; a brother-in-law Frank Edward Eppes Jr.
Michael leaves to cherish his memory: his daughter Tashay Scott of Miami, FL; two devoted sisters, Patricia B Eppes of Burkeville, VA and Valerie A Booker of Crewe, VA; two devoted brothers, Donald E Booker (Elizabeth) of West Palm Beach, FL and Andre L Booker (Lorraine) of Salem, NJ; two Aunts, Viola Shelton of Grand Terrace, CA and Lillian B Jones (Irby Sr) of Mechanicsville, VA; devoted friends, Raymond Barbour, Lynn Adams, Rufus Jeffries and Chris Jarrett; and a host of nieces, nephews, cousins, other relatives, and friends. Funeral Services Thursday, January 3, 2019 at 12:00 noon at W.E. Hawkes & Son Funeral Home, Blackstone. Interment Virginia Veterans Cemetery, Amelia. To plant a tree in memory of Michael Jerome Booker, please visit our Tribute Store. "Email Address" would like to share the life celebration of Michael Jerome Booker. Click on the "link" to go to share a favorite memory or leave a condolence message for the family.